I take the dust of Lotus like feet of my teacher. I clean the mirror of my mind. I narrate the pure glory of Sri Ram Chandra who is the giver of the four rewards, viz. Dharm, Arth, Kaam and Moksha. 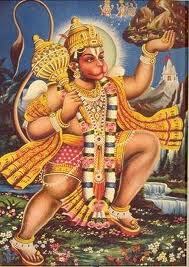 Knowing myself to be ignorant, I remember Hanuman, the son of wind (Pavan). Kindly Bestow upon me strength, wisdom and knowledge, and remove my miseries and blemishes. Victory of Thee, O Hanuman! You are the ocean of wisdom and virtue. Victory to the Lord of monkeys! You are known in all the three worlds. You are the messager of Ram and the repository of immeasurable strength. You are the son of mother Anjani. The son of the wind is your name. You are the most valiant and brave, with a body like lightening. You are the dispeller of evil thoughts and the companion of good thoughts. Your complexion is golden colored. Your dress is pretty, wearing rings in the ears and your hairs are curly. Your are holding a lightening bolt in one hand and a flag in the other hand. A sacred thread made of moonj is decorated at your shoulder. You are the emanation of Lord Shiva and you are the son of Kesri. Your aura and power is so great that it is prayed by entire universe. You have knowledge, you are virtuous, you are very clever. You are keen to do the work of Shri Ram. You are greedy to listen to the narration of Lord Ram's nature. Ram, Lakshman and Sita hold you dear in their hearts. You took a tiny form to appear before Sita when she was emprisoned by Ravan. You took a terrible form to set Lanka afire. You took a mammoth form to kill demons. You straightened out the works of Shri Ram. You brought the 'Sanjivani herb' and saved the life of Lakshman. Shri Ram happily took you in deep embrace. Shri Ram praised you a lot and said "you are dear to me like my brother, Bharat." "Let a thousand mouths sing your glories", thus said Shri Ram and embraced you at his neck. Sanak and the sages, Lord Brahma, the great hermit, Narad and the cosmic serpent, Sheshnag sing your glories. Even Gods like Yamraj, Kuber, and Digpal fail to narrate about you in toto, what to talk of denizens of the earth like poets and scholars. You obliged Sugriva. You introduced him to Shri Ram and he got the post of king. The Sun is at distance of thousands of miles and it takes eons to reach there. You gulped that, considering that to be a sweet fruit. Carrying the Lord's ring in your mouth, you jumped across the ocean from Rameshwaram to Lanka. There is no wonder that you can achieve such a feat. All the happinesses rest under your grace. When you are the protector, then no one else’s fear is there. Ghosts and evil spirits don’t come near when devotees speak the name “Mahabeer”. 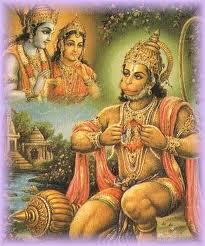 The maladies perish and entire pain disappears by regularly reciting brave Hanumanji's name. 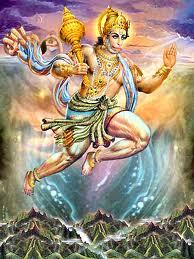 Hanumanji rescue them from danger, who brings him in thoughts, rituals and words. Your glory is remains in the four ages (Satyug, tretayug, Dwaparyug and Kaliyug) and your aura is famous all over the world. You are the protector of saints and sages. You destroy the Demons, you are dear to Shri Ram. You are the giver of eight Sidhis and Nava Nidhis, that was the boon given by mother Sita. You hold the essence of devotion to Shri Ram. May you always remain His Servant. Through praying to you, one finds Shri Ram and forgets all the suffering of several lives. Then, after death, one enters the abode of Sri Ram and is known as a devotee of Hari, getting new birth. O the Son of wind, O the reliever of dangers, you look is the statue of auscpiciousness. Please reside in my heart along with Shri Ram, Lakshman and Sita. "Hanuman Chalisa" is a Religious stotra (chalisa meaning 40 - referring to the 40 chaupais/verses) of the Hindus. Hanuman Chalisa is a Hindi song written by Mahakavi Goswami Tulsidas in the sixteenth century in praise of Lord Hanuman. It is one of the most sacred song of the Indian Mythology. This song describes the devotion of Sri Hanuman towards Sri Ram. Sri Hanuman helped Sri Ram in the battle against the evil and kill Ravana. 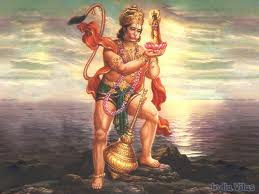 Sri Hanuman was the known for his courage and strength. He had the strength to enter the kingdom of Ravana and turn the city into ashes. He with his huge army of people like him were very much responsible for the victory of good over evil. Hanuman Chalisa is the prayer in 40 verses written by Tulsidas. Each such verse is called a chaupai (means 4 legs) and each chaupai of the Chalisa has two lines each, the two always rhyme. The chalisa is sung in different tunes (more than 100) across the country. Hanuman's Physique: He is the symbol of muscular Hinduism. His physical strength is mentioned in verses 2,3,5 (the thunderbot mace), 9,10,11,18,19,23 and 24. The chalisa repeatedly mentions the halo that surrounds the deity's entire body (tej). The good are awe-struck by it while evil people find it scary. Verse 23 alludes to the ferocity of Hanuman's anger. Verse 9 and 10 tells the power of Hanuman to transform himself physically. Hanuman's Intelligence: The first verse says that Hanuman is a sea of wisdom and virtue. Verse 7 reiterates these two qualities. Verse 16 hints at his negotiating skills and the next verse speaks of the excellence of his advice. Beloved of the Gods: Verses 13,14 and 15 tells how the gods sang paeans in praise of Hanuman. His heroic acts: Verses 18 and 19 recount the incidents of the sun and the signet ring respectively showing his heroic deeds. Love for Ram: Verses 7 and 8 tells how intensely Hanuman loved his Lord Ram. Verses 12,13, 21 and 32 show the relationship between Ram and Hanuman. Hanuman and Sita: Verse 31 tell the Boons grated to Hanuman by Sita. Hanuman as the mediator: Verses 21 and 33 show the way to attain Sri Ram through Hanuman. Hanuman's humility: Verse 9 tells the humility when he met Mother Sita. Hanuman's blessings: Verses 20,22,24,25,26 and 36 remind that Hanuman is a remover of adversities (sankat mochan) for his devotees. Praise of Hanuman: Verses 29, 35 and 36 is in sheer praise of Hanuman. When the Hanuman Chalisa should be chanted? The Hanuman Chalisa should be recited at least once in a week (Tuesdays or Saturdays). Early morning and after the sunset are the favored times. It is recommended to recite the Chalisa 11 times (Hanuman being the 11th incarnation of Lord Shiva). Some recite the prayer everyday, normally before getting out for work. Tulasidas suggested that the Hanuman Chalisa should be recited a hundred times in order to obtain special benefits and in special occasions - serious illness, important examinations, major hurdles etc..
Hanuman Chalisa is the written hymns of Goswami Tulsidas which praises Lord Hanuman who is known as a symbol of auspiciousness. It is recited as a prayer everyday or every week by many followers and has gained enormous popularity among the many Hindus across India and the world. Whoever chooses to recite the Hanuman Chalisha (chalis meaning 40 - referring to the 40 chaupais/verses) 100 times regularly shall free themselves from the cycle of birth and death - leaving one to enjoy the highest bliss. It is also believed to give you a prosperous life, helping one reach their goals and soothe all their pain and sufferings; giving health and all the happiness that one desires.